This is one of the best examples of an Agate Basin points from Illinois. It's very well made and longer than typical examples. This one measures slightly over 5 1/2 inches. 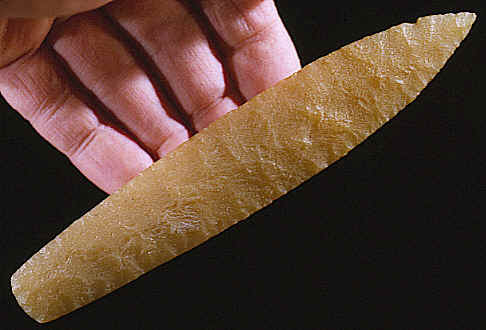 The beautiful stone from which this spear point is made is one of the reasons it is unique. This Agate Basin point was made from Hixton Silcified Sandstone. It was found by a bulldozer operator in 1950 along with two others that were made of white Burlington chert. Agate Basin points were named after the Agate Basin bison kill site in eastern Wyoming. Excavations of the site exposed a large communal bison kill located in an arroyo. It was first discovered when projectile points (Agate Basin points) and extinct bison bones were found eroding from the arroyo bank (Frison, C. George, 1982, p.1). A total of 169 broken and complete Agate Basin points from this site are in known collections. The Agate Basin site was collected for some time by private individuals. Not all of the points found there were recorded but it's believed that the 169 points represent the majority of the projectile points found there (Frison, C. George, 1982, p.80). Many of the spear points found on the Agate Basin site were reshaped by repairing previously broken tips and bases. Some of the points had been broken by impact fractures when the spear struck the animal (Frison, C. George, 1982, p.80). Agate Basin points have been dated in the High Plains area of the western United States to approximately 8,500 to 7,500 B.C. They are most commonly found in the Great Plains with some specimens occurring in the Mississippi Valley and other parts of the Midwest. Agate Basin points are long and slender with parallel or slightly convex sides. Some also exhibit superb horizontal flaking with basal grinding. They range in length from 2 to 6 inches and have bases that vary from convex to slightly concave.